Downtown Waldport is only a mile and a half south of the Owlhaven, with more than enough to occupy you for a morning or an afternoon. Ready to go? Head to the Bayhore neighborhood entrance, turn right and head south on highway 101. 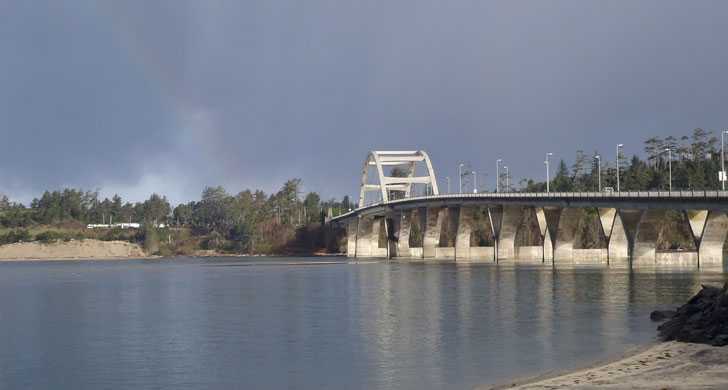 The best way to truly enjoy the Alsea Bay Bridge is to walk across. The sidewalk across the bridge is safe and walled off from vehicle traffic, and there are scenic overlooks at both ends of the bridge. The first quarter mile of road before you get to the bridge has no sidewalk, though. Scope it out ahead of time or go by car if members of your group aren’t good on uneven terrain or next to busy traffic. 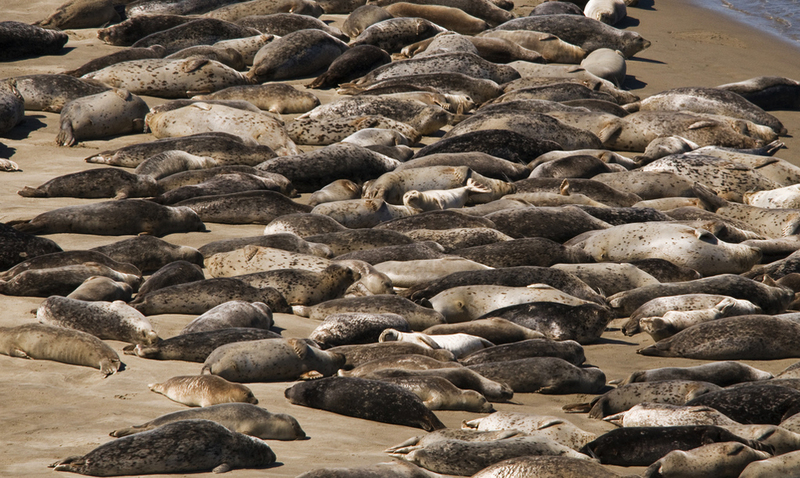 As you cross the bridge, or enjoy the view from the overlooks at either end, be sure to watch for groups of harbor seals sunning themselves near the bridge pilings and along the edges of the bay. Viewing them from a distance is best, to be sure not to disturb them. At the south end of the bridge, visit the Alsea Bay Historic Interpretive Center. (Open 9:00 AM – 4:00 PM Tuesday through Saturday, free admission.) There you can see models of both the old and the current bridge across the bay, as well as other items from Waldport’s past. For a more in-depth look at the history of Waldport, you may also enjoy the Waldport Heritage Museum. (320 NW Grant Street, open 12-4 Thursday through Sunday, free admission). Both these museums are small and could easily be toured in an hour or so. Just past the bridge museum, the first block of main street has something for almost anyone. The Chocolate Frog is sure to delight sweets-lovers with salt water taffy by the handful! Book lovers will enjoy a look into Well-Read Books, and quilters will want to peek into Ruth’s Family Fabrics. Continuing south down the main road, along with a bike shop and a furniture store, you’ll also find a thrift store, a drug store, and a couple different flea market type antique stores that feature cute painted and vintage furniture along with plenty of funky beach decor. Waldport offers multiple food options that are affordable and tasty. Check out this post for a run-down on some of my favorites, including awesome honey walnut prawns from the China Restaurant (the bright yellow building just down from the bookstore) and huge juicy burgers (Chubby’s Food Cart across from the China Restaurant). Further down the road you can score good pizza and fabulous sweet potato fries at Grand Central Pizza, or fresh Mexican food at Fresco. Need groceries before you head home? 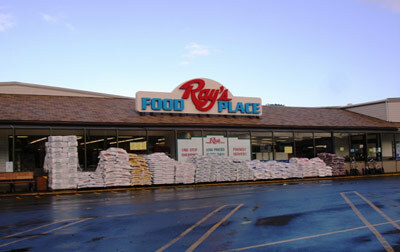 Check out Rays Food Place at 580 NE Broadway Street in Waldport. They carry a full selection of groceries, a small deli, and decent gift and floral departments. Get all stocked up and then head back to the Owlhaven to relax, or pull together dinner in the fully equipped kitchen. By the way, when making your shopping list, remember that pantry at the Owlhaven is yours to use, and is typically equipped with a selection of basic seasonings, as well as baking soda, baking powder, oil and shortening. So be at home!